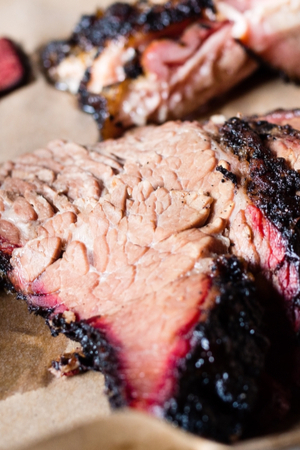 If you have ever spent any time in the south, you will definitely come across a barbecue restaurant that is known for their smoked brisket recipe. Whether it is Tennessee, Texas or Kansas, barbecue is wildly popular and each state will claim to have the best barbecue in the country. Delicious slices of smoked brisket. The claim to fame is a much debated topic. Take a look at all of the reality barbecue shows. 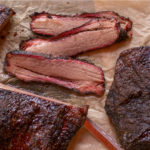 They are filled with famous pit masters squaring off to win the honor of claiming the best smoked brisket recipe or making the best barbecued rack ribs in the world. Although I have never been an official judge at a barbecue competition, I have been to more than my fair share of barbecue restaurants around the country. And just like everyone else, I have my opinion on where to find the best barbecue. In Tennessee, I prefer to eat pulled pork. They barbecue the whole pig in a pit style smoker. The smoked meat falls off the bone and is infused with the the delicious flavor of the wood chips. Once you get your brisket be sure to trim off the excessive layers of fat. Whether served on a bun or naked on a plate, little to no barbecue sauce is needed. However, if you are searching for the absolute best smoked chicken, I would travel to Kansas. Chickens are either hung and rotated above a hot outdoor fire pit or put in an enclosed smoker until moist and juicy. Again, the meat pulls easily off the bone and who can resist drizzling a little Kansas barbecue sauce over top. But there is nothing like tasting a famous Texas smoked brisket recipe. I have had some excellent smoked brisket over the years. But when you find the absolute best smoked recipe, there is nothing that compares. 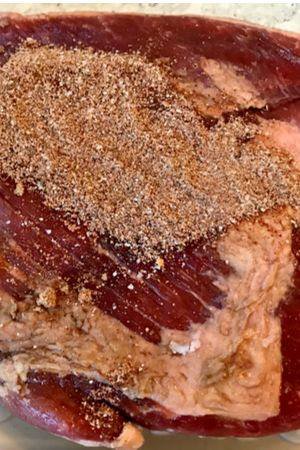 A dry rub being spread on top of a scored piece of brisket. I thought I had the best brisket and skillet corn at a restaurant in Tennessee. This establishment had been featured on the television show “Man, Food & Fire”. After standing in line for more than a half hour, I wasn’t disappointed. It was absolutely delicious and the most moist smoked brisket recipe that I had ever tried. I told everyone about it and frequented the restaurant any time that I had an urge for barbecue. But that all changed when I visited south Texas. As you can imagine, there are barbecue restaurants and smokers nearly at every corner. Allow the brisket to absorb the dry rub overnight for best results. Food trucks with smokers attached to the back of their truck lined every street. There were so many options to choose from! But there were a few restaurants that were recommended by the locals. Within the first week, we had visited several and realized that here is where we could truly find the BEST smoked brisket recipe! Because I couldn’t stay in Texas forever, I knew that I would have to learn to make my own smoked brisket recipe at home. 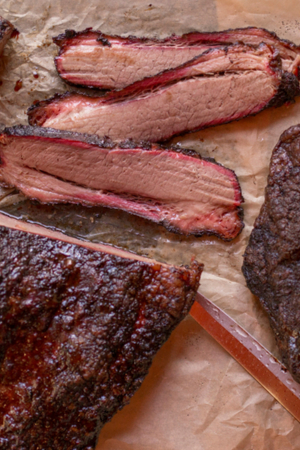 As the smoker heats up, bring the brisket to room temperature. I was very fortunate to have found a pit master who was willing to share his recipe with me. I was shocked to find out how simple the recipe was. It really is more of a technique and process, than a true recipe. Yes, of course there is a homemade dry rub to be made. But after that, it really is the smoking process that makes the best smoked brisket recipe. The biggest thing to remember is to not rush the process. The second half of the process is enclosing the brisket in a container with a glaze. The first step actually occurs the night before the brisket actually goes into the smoker. After removing the very fatty layers, score the meat and apply the dry rub all over the brisket. Then let it sit in the refrigerator overnight to allow the spices to penetrate into the meat. And before you are ready to put it in the smoker, let it come to room temperature. This decreases the shock of cold meat being put into a hot smoker. The smoking process is done in two steps. The first step entails smoking the meat low and slow inside the grill. Moist and juicy brisket with a pink smoke ring and the charred outside. Followed by a glazing process in an enclosed container within the smoker. Each step is equally important in achieving the best smoked brisket recipe. I had always thought that I had to soak wood chips before putting them in the tray of the smoker. I would do this for about an hour and add them right before I added the meat to the grill. However, after speaking to several pit master experts, I found that this was an unnecessary step. 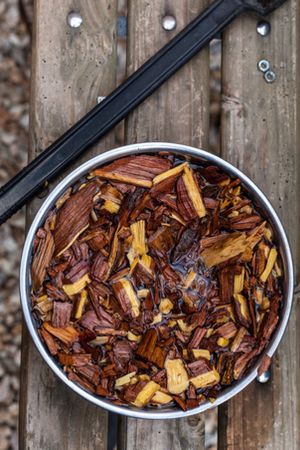 Soaking the wood chips in water is unnecessary prior to smoking. Soaking the wood chips leaches a lot of the flavor into the water that gets tossed out. Instead, use dry wood chips to infuse as much smoked flavor into the meat as possible. 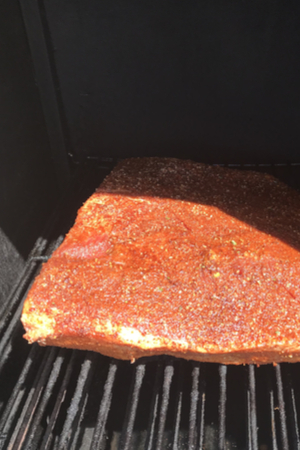 The next question comes as to what type of wood chips to use for this smoked brisket recipe? I have found that both hickory and apple wood chips makes for the best flavor. In fact, I prefer to mix the two in a 1:1 ratio for optimal smoking flavor. So now that you know how to make the best smoked brisket recipe, it’s time to get the smoker out and give it a shot! 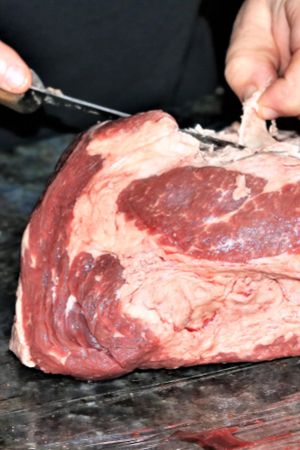 How to smoke brisket so that it is fall apart tender and juicy each and every time. The night before you cook your brisket removed the thick fatty areas and score the meat so that it can absorb the rub. 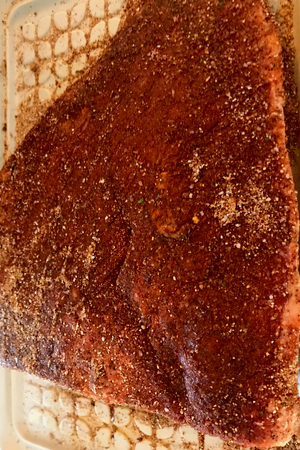 In a small bowl, combine the garlic salt, pepper, chili powder, brown sugar and smoked paprika and generously massage it over all sides of the brisket. Place it in a shallow dish, cover and refrigerate overnight or for at least 8 hours. Prepare your smoker to 225 degrees F. Set the meat out and allow it to come to room temperature. Once the grill comes to a steady temperature for at least 15 minutes, add the wood chips. 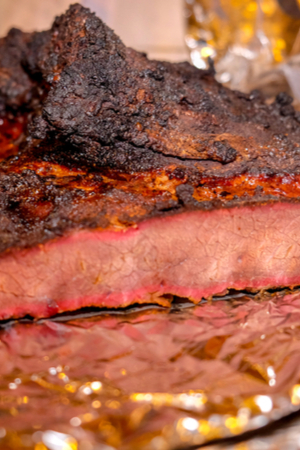 Put your brisket on the smoker and let smoke for 5 hours or until the internal temp reaches 170 degrees F.
Right before the 5 hours is up, combine the glaze ingredients of brown sugar and apple juice. Once the brisket hits an internal temperature of 170 degrees, remove it from the grill and place it in a metal baking dish. Drizzle the glaze over top of the brisket and cover with foil. Put it back into the smoker. Cook the brisket for an additional 2 hours or until the internal temp of the thickest section has reached 190 degrees F.
Once you remove the brisket from the smoker, continue to cover and let rest for 30 minutes. When ready to serve, cut against the grain into 1/4” slices.